Camelback Seventh-day Adventist Church has been blessed to host many outstanding musical artists over the years. This year will be no exception. We are pleased to present our 2017-2018 concert series. You will not want to miss even one of these inspiring performances! Plan to attend and bring a friend! Thirty-two men have been a part of the King’s Heralds since its founding in 1927. They’ve recorded over 100 albums in thirty different languages in a variety of musical styles, making them a favorite with audiences of all ages. The rich blend, harmony and balance of their a cappella style has been enjoyed not only the United States, but also in over 50 countries including the islands of the Caribbean, all of Latin America, the South Pacific, Australia, Asia and Africa. Their audiences have included heads of state, governors, ambassadors and other dignitaries. SATURDAY April 14th, 2018 - 11:00 am. 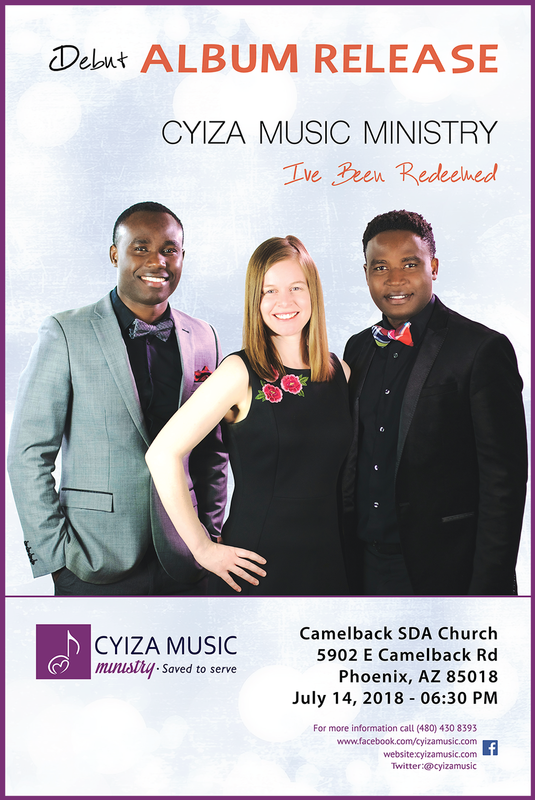 Join Cyiza Music Ministries at Camelback SDA Church on Saturday, July 14, 2018 for a concert celebrating their debut album release. You will hear selections from the new album "I've Been Redeemed" and other crowd favorites.